ODC Design was appointed to provide fit out services for Procurement Australia which is a national organisation of approximately 800 members specialising in negotiating and facilitating procurement contracts. Our client’s objective for the project was to create a contemporary, sustainable workplace that values their staff wellbeing, promotes innovative teamwork and reinforces the culture of their organisation. The open plan layout and activity based working design such as adjustable desks in the staff areas, amplify Procurement Australia’s branding by bringing it to life in built form. To highlight the importance of their members, the lounge area is a quiet, relaxing haven and incorporates a variety of seating arrangements including a hot desk area, which allows for flexible workplace solutions. 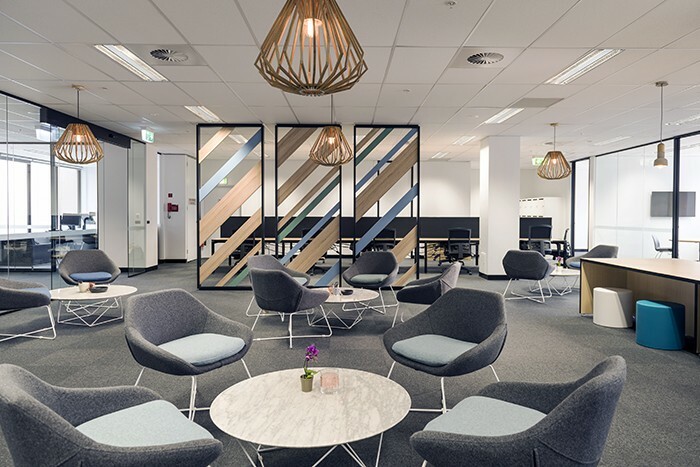 Corresponding with the Procurement Australia brand, the fit out embraces a fresh and contemporary design which helps to diminish existing perceptions of a government organisation that is traditionally of a more corporate look and feel. The designer was able to achieve this with the use of light natural timbers bringing warmth into the space and a fresh colour palette of furniture upholstery and joinery. The introduction of activity based working principles also improves staff productivity and moral with a more collaborative working environment.